Marilyn Strutchens, Ph.D., and W. Gary Martin, Ph.D., along with partners developed Professional Mathematics Learning Communities. The Developing Effective Mathematics Learning Communities (DEMLC) project was funded by the Auburn University Intramural Grant Program with additional funding for participant support from the East Alabama Regional Inservice Center (EARIC). Its goal is to increase participation among underrepresented racial and socioeconomic groups in the K-12 mathematics pipeline. The focus of this community is to increase participation in advanced level courses, encourage effective work across teachers at different academic levels, and to engaged parents and the community. Transforming East Alabama Mathematics (TEAM-Math) partnered with the Alabama Math, Science, and Technology Initiative at Auburn University (AMSTI-AU) and six targeted school feeder patterns from six districts which have been involved in previous learning communities projects. Funded by the Alabama Math, Science, and Technology Initiative’s Mathematics and Science Partnership Grant Program, this initiative extends the DEMLC, including more participants. This project established professional learning communities (PLCs) to provide collaborative and sustained professional development for teachers in targeted K-12 schools in East Alabama. The immediate focus of the professional development is the Alabama College and Career Ready Standards, especially the Standards of Mathematical Practice. This project established professional learning communities (PLCs) to provide collaborative and sustained professional development for teachers in targeted K-12 schools in East Alabama. 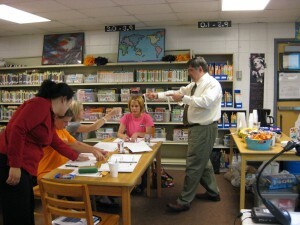 The immediate focus of the professional development is the Alabama College and Career Ready Standards, especially the Standards of Mathematical Practice.